The binary compounds of boron with hydrogen are called Boron hydrides. 1)BnHn+4 (called nido borane) such as B2H6 (diborane), B5H9 (pentaborane) , B6H10 (hexaborane) , B8H12 (octaborane) , B10H14 (decaborane). 2)BnHn+6 (called arachno borane) such as B4H10 (tetraborane) , B5H9 (pentaborane), B6H10 (hexaborane), B8H14 ( octaborane), B9H15 ( nonaborane). 1) By reduction of boron trifluoride etherate with Lithium aluminium hydride in diethyl ether. 2) Diborane is prepared in the laboratory by the oxidation of sodium borohydride with iodine in diglyme as solvent. 3) On the industrial scale, diborane is obtained by the reduction of BF3 with sodium hydride. Higher boranes are obtained when B2H6 is heated at 373-523 K.
Diborane is a colourless ,highly toxic gas, b.p. 180 K.
Diborane is stable only at low temperature. When diborane is heated in a sealed tube, between 373- 533 K, a complex reaction occurs and various higher boranes are formed. By careful control of temperature ,pressure and reaction time , different individual boranes can be obtained. It catches fire spontaneously upon exposure to air. It burns in oxygen evolving an enormous amount of heat. Like diboranes, higher boranes spontaneously burn in air. Boranes are readily hydrolysed by water to form boric acid. With methanol ,trimethylborate is formed. Diborane on treatment with Lewis bases first undergoes cleavage to form borane which then reacts with Lewis bases to form adducts. Diborane combines with ammonia to form an addition product, B2H6.2NH3 formulated as [BH2(NH3)2]+ [BH4]‾ , which when heated to 473 K decompose to give a volatile compound called borazine or borazole. Borazine is isoelectronic and isosteric with benzene and its structure is similar to that of benzene expect that in benzene the π-electrons are completely delocalised but in borazine, they are only partially delocalized. Because of its similarity with benzene , borazine is also called inorganic benzene. Several metal hydrides react with diborane to from tetrahydridoborates known as borohydride. All these contain the tetrahedral [BH4]‾ ion. Both sodium borohydride and lithium borohydride are used as reducing agent in organic synthesis. They also serve as starting material for many other borohydrides. Diborane dissolves in strong alkali to produce metaborates and dihydrogen gas. Diborane reacts with halogen acids to give halodiboranes evolving H2 gas. Thus HI react at about 323 K in absence of catalyst while HBr and HCl reacts in presence of their aluminium halide as catalyst. Halogens also react with diborane to form the corresponding halodiboranes. The reactivity decreases in the order: Cl2 > Br2 > I2. Thus Cl2 reacts explosively at room temperature, Br2 reacts rapidly at 373 K while I2 reacts slowly at still higher temperature. 1) Dibornae is used for preparing a number of boronhydrides such as LiBH4 , NaBH4 . 2) It is used as a reducing agent in organic reactions. 3)It is used as a fuel for supersonic rockets. 1) In diborane, each boron atom has 3 Valence electrons for sharing. If we assume that each boron forms 3 covalent bonds with 3 hydrogen atoms, then there are no electrons left with boron atom for sharing with other boron atoms. Therefore the two boron atoms cannot be linked. 1) The four hydrogen atoms (two on left and two on right shown by thick lines) are called terminal hydrogens. These four terminal hydrogens and the two boron atoms lie in the same plane while the remaining two hydrogen atoms- one lying above and one lying below this plane form bridges and hence are called which bridged hydrogen. bana are two types of bonds in B2H6 molecules. 2) The two bridge bonds i.e. B—–H—–B are quite different from normal covalent bonds. 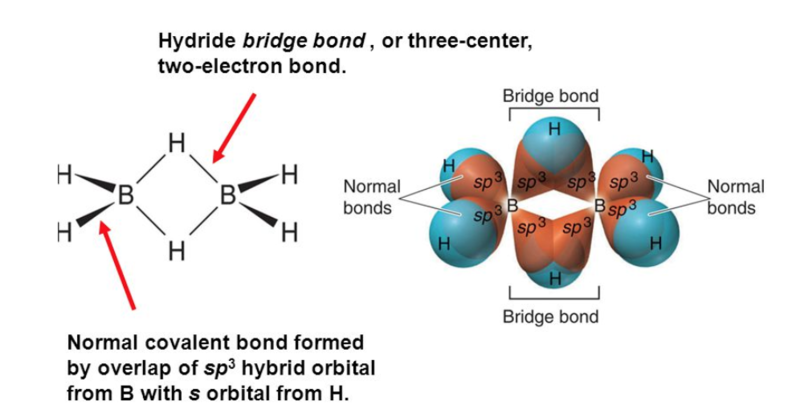 Each bridge hydrogen is bonded to two boron atoms by a pair of of electrons. These are three centre electron pair bonds or three centre 2 electron bonds and hence are quiet weak. Because of their semblance to a banana, these three centre electron pair bonds are also called banana Bond. The boron atom in the excited state is 1s2 2s1 2px1 2py1 2pz0 . The two half filled hybrid orbitals of each boron atom overlap with the half filled orbitals of hydrogen atom forming normal covalent bonds whereas the third half filled hybrid orbital of one boron atom and the vacant hybrid orbital of the second boron atoms overlap simultaneously with the half filled orbitals of hydrogen atom The electron cloud contains only two electrons but spreads over 3 atoms. That is why this bond is called three centre electron pair bond. Because of the shape of the electron cloud formed, it is called banana bond. Molecules like B2H6 which do not have sufficient number of electrons to form normal covalent bonds are called electron deficient molecules.